In the Beatles discography this, their fourth album, presents some problems. 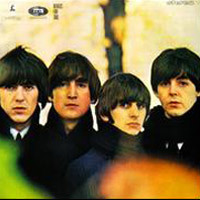 On its own, Beatles For Sale is a fine album with several excellent songs on it. However, coming after the triumph of the Hard Day’s Night album, there’s no question that this sounds like the Beatles running a little low on petrol. Exhausted by their schedule of touring and recording, unable to get a moment’s peace, being pushed for more, more, more by their manager Brian Epstein and a music industry that was ravenous for new Beatle music, it’s no surprise that Beatles For Sale fails to live up to the expectations set by its predecessor. The pace at which the Beatles were living was so fast they were grateful for so much as a single day off. If A Hard Day’s Night represents the peak of the cultural revolution of Beatlemania (and I think it does), then Beatles For Sale is the inevitable hangover from that particular party. After nearly a full year of seeing their hotel bed sheets cut into one-inch squares and sold, Beatle wigs, Beatle buttons, Beatle guitars, television appearances, concert tours, a movie…it’s no wonder the album was called For Sale, and the faces looking out from the cover were downbeat and gloomy. Once again, For Sale did not exist as an LP in America. Capitol Records wanted their Mop Tops to look happy, so they again cannibalized the LP and various singles to create two new albums, and plastered their four smiling faces in various silly poses on the cover. For sale, indeed. The problem with these songs are not the songs themselves or the performances. The problem is that the Beatles had already progressed well beyond this type of material. With some exceptions, the Beatles always sounded much more comfortable doing their own music than they did doing covers. By late 1964, these originals were sounding less like the covers than ever. There’s simply no comparison between a rehash of a Carl Perkins song and the acoustic introspection of a song like “I’m A Loser.” The latter, with its strummed acoustic guitars and wailing harmonica clearly reflect the influence of Dylan while the lyrics are a vivid demonstration of the toll that Beatlemania was taking on Lennon. “I’m A Loser” carries the same theme as “Help!” would the following year. “Baby’s In Black” swings, once again held together by acoustic guitar and little stabs of electric lead. But here the lyrics are a far cry from “I Want To Hold Your Hand” or “She Loves You.” The lyrics recount the singer’s frustration at being unable to woo his intended because her lover has died, but for a song whose tagline is “Baby’s in black and I’m feeling blue” the music is irrepressible. Rarely in the Beatles career has a lyric and music been so mismatched, although the combination works like a charm. “No Reply,” which kicks off the album in grand fashion, also tells a tale of lying and cheating against a mostly acoustic backdrop. Taken together, these three songs are a triptych that clearly illustrate where the songwriting team of Lennon and McCartney were…and it wasn’t covers of ’50s rock ‘n’ roll classics. Beatles For Sale is a schizophrenic album, capturing the Beatles at a fascinating time in their history as they were starting to shed the “happy little rockers” image and starting to explore more diverse instrumentation, more introspective lyrical themes, and different types of music. The covers are all very good, and remind the listener of how the Beatles began their career. The originals were, for the most part, remarkably different and served as a signpost to where the Beatles were going. All of this makes Beatles For Sale an ordinary album from an extraordinary group. The album has the feel of being filler material, though it’s far superior to the usual stuff that passes as filler. This is the only Beatles album that does not feel like an artistic statement but rather comes across as a holding pattern. There’s just enough of the old rockers to keep the kids happy, just enough of the new sound to intrigue the more astute listeners and whet their appetite for the next step. Beatles For Sale is an important album for this reason: it is the last album released by the lovable Mop Tops. Tired and frustrated by the grind, they recorded several songs that they could have done in their sleep and several songs that were pointing the ways towards the gob-smacking masterpieces of Help! and Rubber Soul.